Great weather, the wind is cooling and you are in your element - then you run into trouble. A flat tire, the gears aren't catching or the chain has detached. In other words: get your bike tools out! Bike breakdowns are not just a huge nuisance, but they also tend to happen at the worst possible time. That is why it is essential to take your bike tools with you when touring for several days. So it is time to check your tool box and make sure it is fully equipped for any situation! And in it I put... what should you actually have with you? You need to be prepared for every eventuality. If your pedals jam or your tires lose air, it is hugely important to have the right tools on you to remedy the situation. But that is no problem! The brands Park Tool, Tip Top or other well-known manufacturers offer everything you need in a bike breakdown. So let's go: I pack my bike toolbox and in it I put my puncture repair kit. A puncture repair kit is a real essential. And rightly so. A hole in your tire, or rather in the tube is the most common problem for a bike. That is why a puncture repair kit is a must have in your bike tools and breakdown kit. The puncture repair kit generally comes in a set of several patches. These are either self-adhesive or vulcanizing patches. The tire has to be pulled away from the rim so you can get to the inner tube for patching. For that you need a tire lever. These practical little helpers are compact tools that will easily fit into any emergency kit. Which bike tools should go with you on tour? 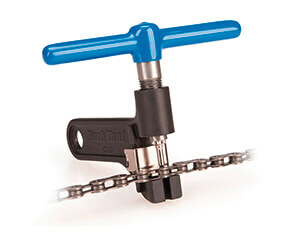 The crank puller is an absolute must-have at all times. That is if your bike doesn't already have a built-in crank puller. 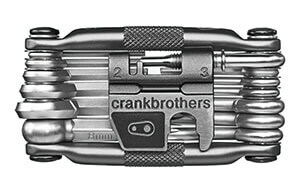 This four edged bike tool, as the name suggests, can remove the crank from your bike which can be done to help solve any problems you may have with the pedals. What else does your bike tool box need? A sprocket remover! This is needed for working on the cogset so it can be fixed into place and won't turn while you work on the bike. A spoke wrench, or spoke key as it is also known is also always useful. This tool can be used to tighten as well as loosen the bike spokes. This allows you to adjust the spoke tension. Different keys like an Allen key for the hexagon socket, cone keys, an open end spanner and pedal wrench are also all very handy tools to have with you. A work stand is also very useful when making larger adjustments. These are usually easy to transport, height adjustable and compact to let you suspend your bike while you work on it. For those who do not wish to pack one of these into their emergency bike tool box should at least consider having one for their workshop at home. When all of that is prepared, then your game of "I pack my bike toolbox" game is done. You are now fully prepared for touring and will always have the tools you need, should you have a bike breakdown!